General Zinni is a member of the Center for Climate and Security’s Advisory Board. He is a retired Marine Corps 4-star General. He joined the Marine Corps’ Platoon Leader Class program in 1961 and was commissioned an infantry second lieutenant in 1965 upon graduation from Villanova University. He held numerous command and staff assignments that included platoon, company, battalion, regimental, Marine Expeditionary Unit, and Marine Expeditionary Force command. His staff assignments included service in operations, training, special operations, counter-terrorism, and manpower billets. He has been a tactics and operations instructor at several Marine Corps schools and was selected as a fellow on the Chief of Naval Operations Strategic Studies Group. General Zinni’s joint assignments included command of a joint task force and a unified command. He has also had several joint and combined staff billets at task force and unified command levels. His military service has taken him to over 70 countries and includes deployments to the Mediterranean, the Caribbean, the Western Pacific, Northern Europe, and Korea. He has also served tours of duty in Okinawa and Germany. His operational experiences included two tours in Vietnam, where he was severely wounded; emergency relief and security operations in the Philippines; Operation Provide Comfort in Turkey and northern Iraq; Operation Provide Hope in the former Soviet Union; Operations Restore Hope, Continue Hope, and United Shield in Somalia; Operations Resolute Response and Noble Response in Kenya; Operations Desert Thunder, Desert Fox, Desert Viper, Desert Spring, Southern Watch, and Maritime Intercept Operations in Iraq and the Persian Gulf; and Operation Infinite Reach against terrorist targets in the Central Region. He was involved in the planning and execution of Operation Proven Force and Operation Patriot Defender during the Gulf War and noncombatant evacuation operations in Liberia, Zaire, Sierra Leone, and Eritrea. He has attended numerous military schools and courses including the Army Special Warfare School, the Marine Corps Amphibious Warfare School, the Marine Corps Command and Staff College, and the National War College. 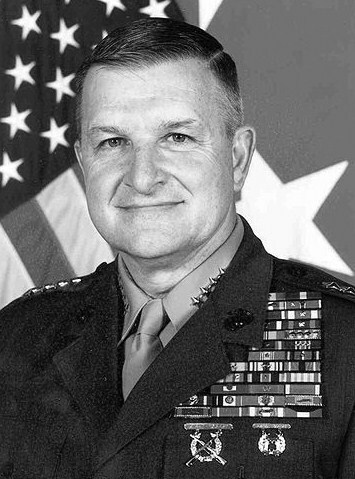 General Zinni has held academic positions that include the Stanley Chair in Ethics at the Virginia Military Institute; the Nimitz Chair at the University of California-Berkeley; the Hofheimer Chair at the Joint Forces Staff College; the Weissberg Chair at Beloit College; the Harriman Professor of Government Chair and membership on the Reves Center for International Studies at the College of William and Mary; membership on the board of Villanova University’s Center for Responsible Leadership and Governance; and selection as a Carter O. Lowance Fellow in Law and Public Policy at the William and Mary Law School. He has also lectured at numerous colleges and universities in the US and abroad. General Zinni retired from the military in 2000 after commanding the US Central Command.